Is Velveeta a Healthy Food Choice? Velveeta, the cheese product found in a variety of dips and added to dishes like mac and cheese, is a guilty pleasure for some people. The gooey product has a permanent home in many Americans' pantries. But if you're trying to diet, lose weight or eat better, it may be time to dump the Velveeta and replace it with a healthier substitute. Velveeta is high in calories and fat with little in the way of nutritional benefits. When you first glance at the packaging, Velveeta looks as though it's relatively low in calories. But you should read the serving size and number of servings for each container. Velveeta packaging lists a serving size of 28 g, slightly less than 1 oz. That 28 g of cheese product has 80 calories. While that may seem like a small number, the packaging also lists that there are 32 servings in each package of Velveeta. That means one box of Velveeta has more than 2,500 calories. The light version has slightly less, weighing in at just under 2,000 calories. Besides being high in calories, Velveeta is high in fat and sodium. 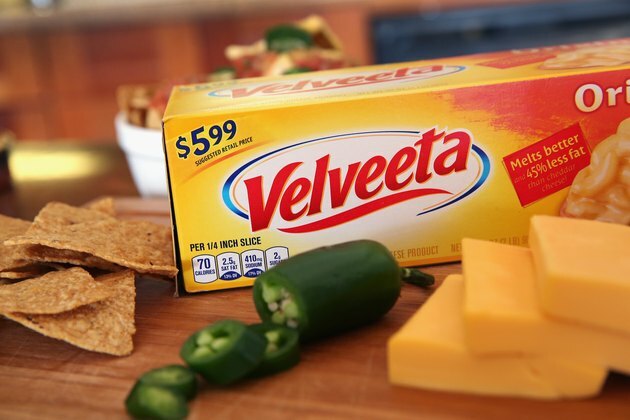 The nutritional information on the package shows that the product has 6 g of fat per serving, but with 32 servings per box, you'll consume 196 g of fat should you use an entire box of regular Velveeta in a cheese dip or recipe. Of the fat, 3 g of every 6 g of fat is saturated, which means it becomes solid at room temperature and could be a major contributor to weight gain. Light Velveeta has half the fat of regular Velveeta, at about 96 g per box. One serving of Velveeta also contains 410 mg of sodium. Its redeeming grace is that each serving also contains 5 g of protein. While Velveeta is sold as a cheese product on its own, the brand has a variety of products based on the soft cheese. You'll find products like shells and cheese, bacon-flavored shells and cheese, au gratin potatoes, Mexican Velveeta, Velveeta cheese slices and Velveeta-based dips. Each product contains Velveeta, so they are high in fat and calories and not conducive to a healthy diet. If you have a craving for some of the creamy recipes that contain a block of Velveeta, you can use low-fat, natural cheese in similar recipes. If it's queso you love, try melting Mexican blended grated cheese with a few cups of natural salsa. The same cheese can be used in making a lower fat, lower calorie version of macaroni with egg noodles. If you're dedicated to eating more healthfully, remove Velveeta from your pantry and replace it with more natural foods in your fridge. What Are the Healthiest Cheeses?